This post is for my hobby of photography. Photography is a art, there are few rules that make for a perfect photo. But sometimes breaking them too makes for a great photo. Placing the required things in an image at 2/3 or 1/3 from either end makes the photo more attractive. This rule can be applied from any side of photo. The boat in the first photo is placed at 1/3 rd distance from bottom and 2/3 rd from top, as is the horizon, this placement catches the eye of the person looking at the photo. Placing the required part of an image along the diagonal is another trick, that catches the attention of the viewer. The diagonal that stretches from on end of the photo to other is the most important to watch out for. Putting the picture into a frame is the best way of making it more attractive. The same rule is used here, with only difference that the photo is framed naturally. The photo shows now the beach and mountain is framed using the greenery near the photographer. The photo also demonstartes how framing, rule of thirds and diagonal rule can be used effectively to make for a great photograph, by framing the mountain, beach using greenary and coconut tree. The horizon is 1/3 rd from the top and the beach is diagonally from one end of photo. If you dont get snaps according to these rule, consider editing them, by keeping these rules in mind. But as I said above sometimes even breaking these rules makes for a great photograph. 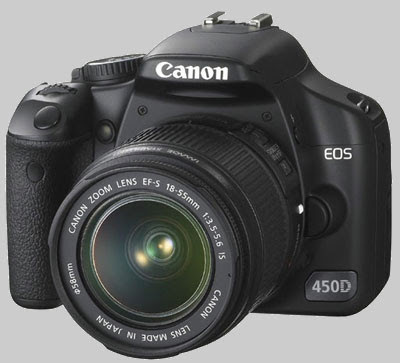 Canon EOS 450D (Rebel XSi) a Digital Single-Lens Reflex camera from Canon is the best of Canon’s addition to the world of Digital Photography. It has high sensitivity CMOS sensor, with effective resolution of 12.20 mega pixels and total 12.40 mega pixel. It can save images both in JPEG and 14-bit Canon RAW format. It features Canon’s Digic-III image processor. Though actual sizes may vary,depending on settings used. All this at MRP $799.99 for only the camera body. You will need to pay seperately for the lens.